It's been a long, long time since bike lanes for Bloor Street had been first proposed. Just ask Albert Koehl, lawyer and cycling advocate, who detailed the history—first proposed in 1977! (Or Hamish Wilson, who for many years carried the torch despite the "Bloored vision" of City Hall—tip of my hat to Hamish's famous turn of phrases for Caronto). Well, today we've finally got an Open House proposing pilot bike lanes for Bloor Street (Trinity St. Paul's 427 Bloor Street West). Now's our chance. The stars are aligning. A critical mass businesses and politicians seems to be building (and screw the rest). Let's show up in force. 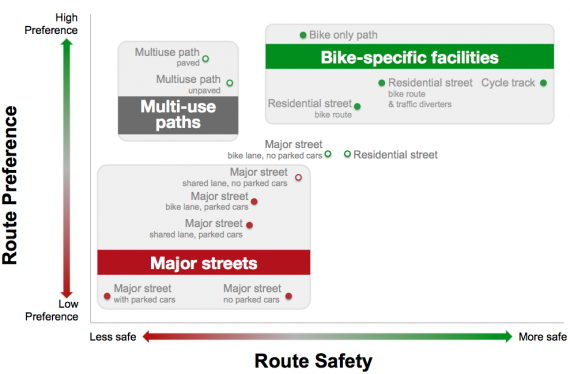 Please note that not all the proposed bike lanes will be fully protected. For some reason in some diagrams they are proposing just paint on one side of the street and bollards on the other. If we're going to build bike lanes, let's do it right! I think the vast majority of people are sick of those drivers that like to park wherever they feel like it thus rendering the bike lane useless. Not to mention that the BICE study long showed that protected bike lanes are much safer than just paint (and much preferred). I noticed that they left the car lane widths at 3.3m, despite Transpo chief Buckley stating that 3m is the new minimum width (if my memory serves me well). That means we've got .6m to play with to add another buffer. "Fully protected" is not necessarily better. I prefer the plain old paint without obstructions. That allows for better situation at intersections. As for parking, it should just be ticketed the hell out of. Right now, there is no enforcement, so no wonder it happens all the time. Totally cool with it as long as they get rid of the street parking and keep 4 lanes for cars. Of course that will never happen because businesses will complain like pack of mentally challenged howling monkeys. Herb, I grilled Dave Dunn about his allocating 3.3m for the car lane width. He is being this generous because of the night buses that are run along Bloor. For a while it seemed as though 3.2m might be acceptable -- hey, we're only talking about the wee hours. But Dave said that the TTC refuses to budge from 3.3. That's too bad, as every centimetre matters. It's going to be a struggle to get continuous protection, but I think we can still do it. Hi Michael, Herb et al. I brought the same issue (3.3lane width) with a number of staff numbers. It is the night buses but more importantly the high volume of TTC shuttle buses that operate when the subway is out of commission - those may get stuck if lanes are narrowed any further. They work very well and because of the parking being retained, there is less opposition to them. Being a trial is good too as opposition to things lessens shortly after a trial is put in as people see what it really is and it isn't a "scary unknown". The alternating of parking on the different sides of the street thing is a bit odd but it'll be okay. It's no big deal to change slightly where you go after an intersection. What's important is that there be good sight lines at intersections. This can only be done by removing a parking spot at each intersection. After the trial is over and they decide to make them permanent, there should be bits of concrete curb put in at the intersections to help guide cars and bikes. Also mid-block it's good to have a some curbs at intervals. If you see someone near their car or on the sidewalk looking like they might walk across the bike lane, you give a little courtesy ding of your bell and stop pedalling for a bit with your hands ready to brake. It's pretty easy to do. If there is NO STOPPING or NO STANDING signs, they should be able to mail in the ticket. Doesn't make sense that 1.3 people in a couple tons of metal, glass, and rubber must block a bicycle lane to fetch some coffee. Staff at the meeting acknowledged that Option C is cyclist central. Option B is business centered. In Toronto we a few blocks where a bike lane is covered by parked cars i.e Hoskins, Simcoe, Lower Sherbourne. It works great. Parking usually ends far from an intersection to prevent potentially unsafe situation. Never heard that anyone was seriously injured by a passenger side dooring. In the worst case scenario you will just fall on the sidewalk. As the City has had the decade since the Take the Tooker launch pre-dating any Bells group, and it's been a FAIL in doing anything but blah-blah about study, and the trans*it is worse etc., I'm impatient. I've also had a new idea, call it Option T, where a reversible rush-hour busway is installed with paint from Lansdowne to Spadina, and two travel lanes and two painted bike lanes. The buses would begin at the High Park Station and be semi-express to Spadina, then south on Spadina in the RofW to say, King, then return by whatever route the TTC wants. The City blah-blahs about corridor studies, but there's a transit corridor, it's really under stress, and no plan to do anything about it. I'm not surprised the City has no clue there can be a transit corridor, it's only been about fifty years since the subway opened, so give it time, right? No stopping, no parking on-road, but there's often scads of options nearby including atop the subway. During non-rush-hours, the central lane could be used for turn lanes and deliveries, and it would enable pedestrian crossings. It's roadical, though I know some will be cross that it's only painted bike lanes, but the City is pretty inept at plowing anything with curves, Keep It Straight, Simple - right? Having separated bike lanes on the east-west roads is really less likely I think given how tight these roads really are compared to oh soooo many examples of elsewhere, and also the relative lightness of bike traffic. So start with paint, and consider Option T..